This iridescent glass tile redefines elegance. Changes in lighting create vibrant highlights and shade fluctuations. From a multi-faceted Indigo Blend to a sophisticated Black Gold Blend, this tile is surprisingly neutral. Feature Tivoli on its own, or combine with metal, wood or stone for a beautiful organic look. 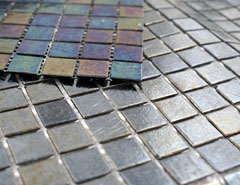 Choose from two iridescent colors that shimmer from a base of black 3/4” glass tile. Tile are mesh-mounted for easy installation.